I, Meesh, have spent 6 months of traveling full time. Thankfully Ester and Aria have been able to come on many of the trips also. 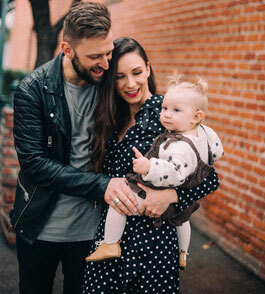 At the end of May we handed off our positions at The City Church as Directors of Generations (overseeing college age down to infants) to focus more on what God is doing through BE MOVED. This freed up our schedule to travel and we were on the road every week. We are taking most of December to rest, be with family, pray, dream and get ready for a BIG 2019! Also, remember this is a great time to receive your year-end tax deductions! THANK YOU for being a part of what God is doing around the world through BEMOVED! We truly cannot do this without your help. In November we celebrated our 3 year anniversary. Though our marriage is not always perfect or always easy we are learning how to become love and live it. We are so excited to be announcing some big things coming up for 2019, so be expecting it in the next couple monthly updates! 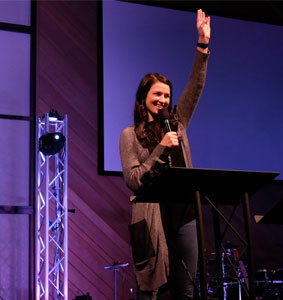 Last month Meesh ministered at 4 different ministries around the nation, from east to west coast. We saw many give their lives to Christ, get healed and set free! It was truly a month of thanksgiving. This is the pastors daughter of the church Meesh was ministering at in Massachusetts testifying of her healing. She had what was supposed to be a simple surgery 2 months earlier but the surgery went drastically wrong. She got nerve damage and could not lift up her arm higher than her elbow. She was unable to go back to work. But at this service she received healing and was able to fully lift her arm with no pain or restrictions! On the left is Pastor Alex and His wife who were both healed. 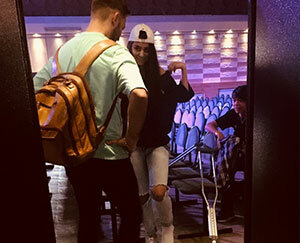 Alex was watching Meesh on live stream and recieved healing in his knee after injuring it and being in pain for over 3 months. 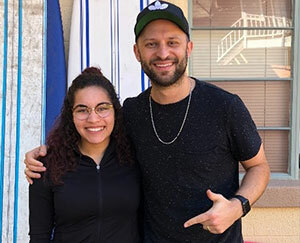 Then Meesh came to his church and Pastor’s wife was healed in her foot after being unable to walk on it properly for many months all the pain left her. 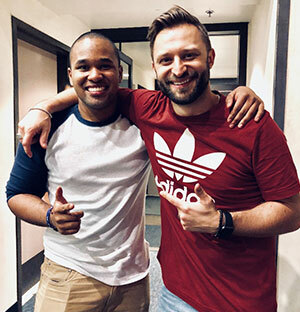 Fedor from New York had a childhood trauma that left him with a heart problem which caused chest pain that would get extreme at times and every morning he would wake up with the left side of his body numb. Every morning it would take him 20 minutes to bring sensation back into his left side. After the prayer he felt the healing, woke up the next morning and for the first time had no numbness of pain! Finished off November strong after 6 months of traveling every week. We are taking most of December to rest and be with family as we get ready for 2019. We are seeing a greater level of authority and anointing in our ministry. We are thankful to all who donated to BE MOVED. Every donation dollar & prayer is so important in helping us reach the world! A good month of rest and preparation for all that 2019 has for us. We need $550 more in monthly reoccurring giving to do what we need to as a ministry and family. We are in need of a second car. Divine connections, contacts and open doors. Pray if God will have you become a monthly MOVE Partner. A passion of Meesh, Ester and BEMOVED is to see children around the world who live in extreme poverty set free! 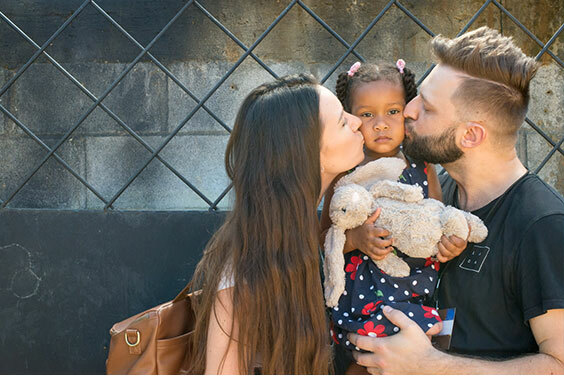 Join us and pick your child to start a relationship with. Your chance to aRELEASE a child from POVERTY here! You can also text BEMOVED to the number 77977 to give a gift today! Thank you for believing in our work, Ester and I love you very much! Thanksgiving releases answers. When we come to God with any need, we can be thankful because we have His promises. Every promise will be fulfilled when we believe it, then we can receive it. let us be thankful for all He has done in our life and all that he has promised for our life. 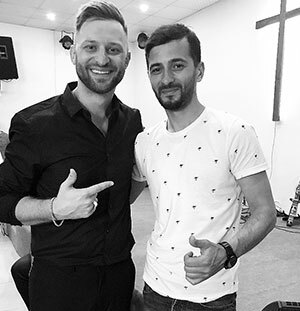 In Armenia we saw God move in such an awesome way. 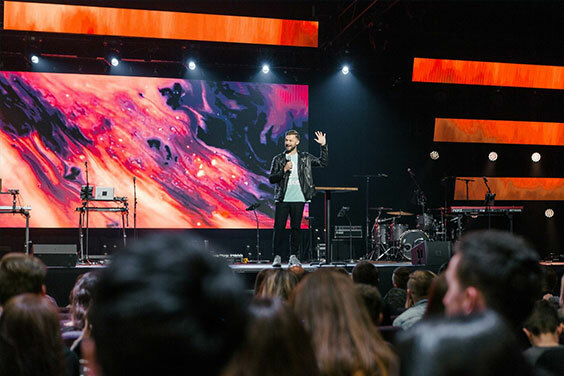 I spoke at the largest evangelical church in the country. 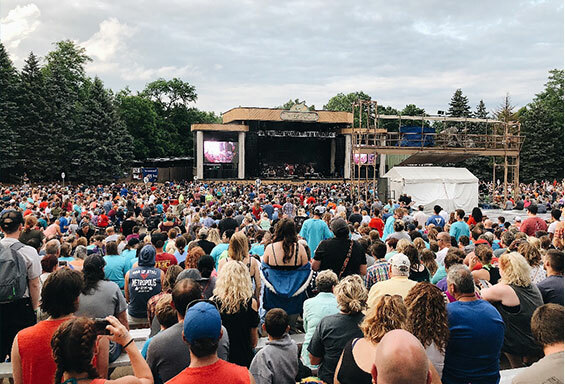 They have up to 8,000 people in attendance on an average weekend and hundreds of daughter churches all over the country. Many were saved, healed and set free. Thank you to all who gave to make this trip possible. We received all the finances needed to make this trip impactful and fruitful. You have sown into great soil and already there is a big harvest coming from this trip to Armenia and Ukraine. God in moving in a unique way in both of these countries. The Gospel is spreading and people are receiving git with hunger. 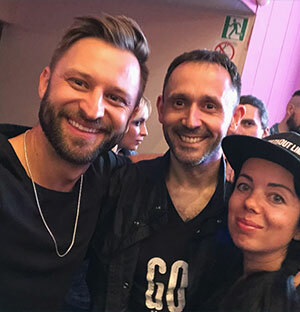 In Ukraine I ministered in 2 cities, preached 10 times in 5 days. We saw unusual miracles and a generation of youth released to influence their cities with the authority of Christ. Doctor Confirmed healing: This is before & after brain scan of Katia. She had a brain aneurysm which caused numbness, loss of sight, dizziness… first brain scan chart shows brain problem. After we prayed she received her healing and went back to the doctor for another scan. The second scan proves everything is completely restored. Doctors were amazed & thought the scan was of a different brain. They took the diagnosis OFF her & she has not had another symptom! 3.5 years ago this lady was diagnosed with schizophrenia, was suicidal and on heavy medication. We prayed for her freedom & mental healing. She believed it, and on her own decided to stop taking medication and wash mind with the word of God & what He told her about who she was. 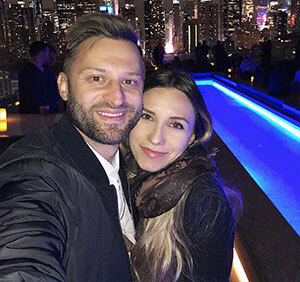 Daily she noticed big improvements, after 3 months she went in for her regular checkup… doctors were shocked at her healing. They confirmed her healthy & took the diagnosis off her. She came back to tell me 3.5 years later she is perfectly healthy! In Ukraine, this girl is testifying of her healing. For many years she had been sick with bronchitis and this year she got pneumonia. After the service she came to me (Meesh) and asked for a personal prayed for her sickness, but had a lot of doubt. I looked at her and knew that she was already healed. I said there is nothing left to pray for, but go to the doctor and get checked out and they will verify the healing. She did and was confirmed completely healed. With your generous giving we collected all the money needed for our ministry trip to Ukraine and Armenia. Ester had her first beauty masterclass and it was a huge success. We finished paying off our 2013 Toyota Prius this month. As the Summer is coming to an end, I get to spend 10 days at home with my girls. This was a blessing, since I have not been home for more than 4 days at a time since May. 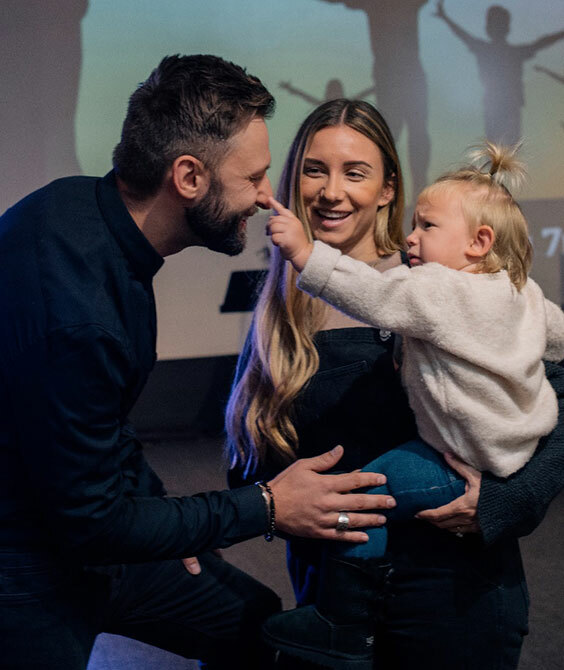 This month, Ester is coming with me on 2 ministry trips and we get to bring Aria with us on our trip to Kentucky, grateful that we get to do this as a family! …And it’s an awesome opportunity for you! Be Moved was birthed with a passion to touch the world, and I have now been to 37 countries. We feel a strong call of God to go to places that most ministers will not. I’m going to Armenia and Ukraine Oct 4-15 to speak at churches, conferences, and also train leaders and teams. As you can imagine the financial burden of theses types of trips is strong especially for a young organization like Be Moved. We will need close to $3,000 to help cover things like flights, living, transportation between cities, and more. The locals will be providing venues, food, and some transportation. Please pray and ask if God would have you partner with us on this trip. This is Jasmine, a pastor who had plantar fasciitis since 2010. It caused constant pain in her foot for over 8 years whenever she would put any pressure on her foot. We prayed at the conference and she received her healing, All the pain is gone! The 3 core values of Be Moved are Reach, Raise & Release. This photo is a deep passion in our hearts, to REACH people and give then an opportunity to accept Jesus as their Lord and Savior. We are thankful for the new doors God is opening. Ester’s beauty and blogging is growing. Health and joy in our family. We need $750 more in monthly reoccurring giving to do what we need to as a ministry and family. Protection over our family as we are wrapping up a full summer of ministry. Devine connections, contacts and open doors. 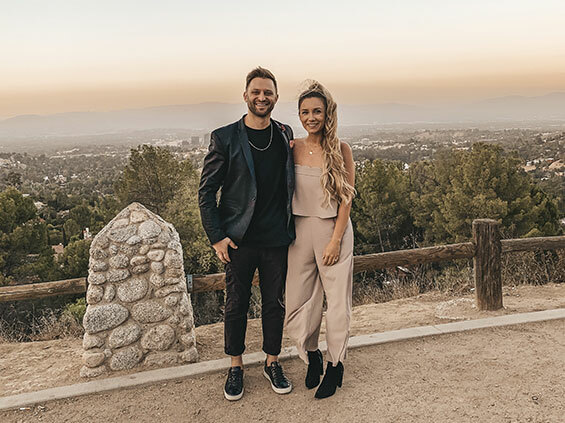 We are happy that August will slow down a bit after the busiest month of my life in ministry. This month we are praying that your life and family would experience rest in your soul and Spirit even if it will be a busy one. I have found that the best REST for my heart and mind is when I give up all worry, stress & control to God. He works all things out and is good at it. We have been seeing such an increase of miracles and healing in our ministry. If you have any needs please reply to this email so we can be praying and believing for you. We went to a friends wedding where Aria stole the show by being the cutest flower girl ever! In July Be Moved was in Jacksonville, Sacramento, Portland, Seattle, Pasco, Spokane, Lake Stevens and Southern California. We witnessed many make decisions for Christ, freedom, baptism in the Holy Spirit and verified healings. Seattle was an extra special trip because I got to go with my family and minister at The Image Church. This was the church I was ordained into ministry and served as the youth Pastor, I was there for 6 years. Fathers day was also a Special family time we got to spend at our home church. Nothing like being a father, especially to our baby girl. We had an unplanned partial family reunion when I was ministering in Spokane, WA at the church my dad pastored. It was unexpected but we had mom, 4 of her children with spouses and 9 grandkids from Philadelphia, Los Angeles, Seattle and Spokane. I taught for 50 hours at 4 different bible schools in July. In Jacksonville, Sacramento, Pasco and Southern California. Nothing like instilling into the next generation of world changers. David was hit by a car a few months ago and was been experiencing constant pain through his legs. After prayer all the pain left him and he was able to move freely for the first time since the accident. Philip tore a ligament in his ankle and has had pain for a few months. Today as he was leading worship and we began to pray for healing, all the pain left and he had full rotation! 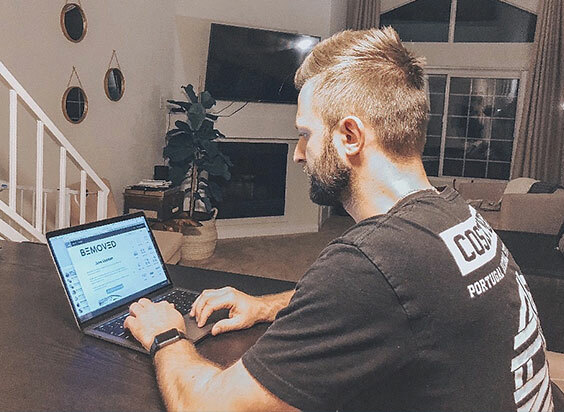 For 7 months Vitaly had pain in his right shoulder because of torn muscles. Had been getting constant deep massages for months. After we prayed he was instantly healed! He began to move his shoulder in ways that were impossible before the prayer. We got through 64hrs of ministry and home for only 6 days of July, but are healthy and motivated! We are getting more ministry requests. We need $1,000 more in monthly reoccurring giving to do what we need to as a family and ministry. We need a second car. We are looking for a media savvy helper. New connections, contacts and open doors. A passion of Ester and I and part of BEMOVED is to see children around the world who live in extreme poverty be set free! Partner together with us and pick your own child to support. July will be full and fruitful! I am scheduled to speak 29 different times. Please pray for strength and my family, they will be with me on a few of these trips. We will be praying that your July will also be fruitful and full of powerful God moments. And please reply to this email with any prayer requests so we can be praying and believing with you. In June we got to speak in Seattle, Arizona, Richmond and Cincinnati. It was amazing to watch God do what he does. We witnessed many make decisions for Christ, get set free and many verified healings. I got to speak for the first time at a Christian music festival. It was an awesome experience at 2 festivals on 3 nights in Richmond, VA and Cincinnati, OH. She had a 6th lumbar in back, it caused issues & curving. Sprained her back years ago & again in December with a herniated disc. Was out for a month in physical therapy & active care. Came to camp with pain & lots of pressure. I got to experience Noah’s Ark. 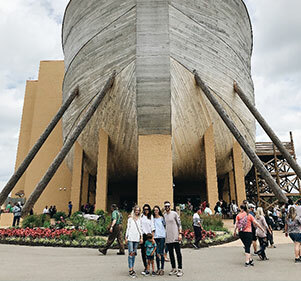 Wile speaking in Cincinnati, I was able to visit my cousins and they took me to Kentucky where this life sized replica of the original Ark was build to biblical scale. It was bind blowing. This guy (sadly I forgot his name) came with a dislocated knee. Doctors said he can’t move it for 8 weeks, but after only one week, we prayed and all the pain left & full movement was restored, no more brace needed! Meet Bill, he said to me that he was very skeptical with supernatural healing. BUT… while he was sitting in the church service, he heard a pop in his foot after I called out a word of knowledge for pain in the right foot. 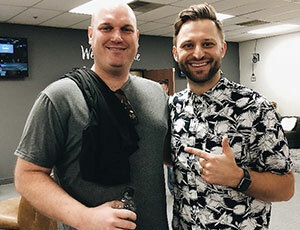 He was instantly healed and in disbelief. He said he never wants to doubt the power of God again! Our family is healthy and motivated! We are getting many ministry invitations that we have to turn some away. We are thankful to all who donated to BE MOVED. Every donation dollar & prayer is helping us reach the world! Protection for our very full summer of ministry dates & busy travel schedule. So many fun things to share this month and a huge miracle that happened for BE MOVED! As we start off this summer at full speed, we are ready for a very busy summer season. May was perfect for us to slow down a bit, pray and get ready for our next season and the big things that God is preparing us for. We even got a chance to take a fun 3 day trip to New York city to spend time together and rest. This newsletter is being written on a BRAND NEW MacBook Pro that was bought for us! What a MIRACLE and answer to prayer. We have been in need of new computer since mine was outdated and even crashed a few times. Thank you Jesus and thanks to those who sowed it into our lives. After wrapping up a trip to Ukraine where I (Meesh) Spoke at a youth conference, I flew to the country of Georgia (right between Europe and Asia). There I met up with Ester and together we got to minister at 5 different services. We witnessed God move powerfully with many saved, healed and set free. Later in May we took a three day trip to New York City. It was without Aria, for us to get some alone time together. Thank God for the free flight and hotel we booked on credit card points. It was what we needed. 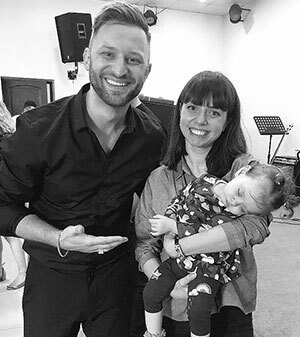 Ester and Meesh speaking together at one of the sessions at Word Of Life Church in Tbilisi, Georgia. I celebrated my 35th Birthday on May 26th! The age is starting to sound a bit old but I dont feel a day over 25, haha. We had a perfect three-night getaway in New York City. One of our favorite places to go. We left Aria with grandma which made our time that much more important and special. 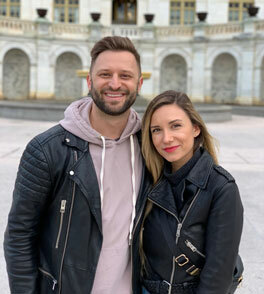 Love dating my wife! Sergey, from Tbilisi, Georgia, had been taking daily medications for his severe head pain for a couple years. This also affected his whole body with chronic pain. After we prayed, he said he felt the pain leave instantly and stopped taking medication. Now is living pain-free and medication free! This lady came and asked me to pray for her daughter who had not eaten for three days and the doctors wanted to take scans. After we prayed, the baby began to eat! She went to the doctor the next morning and the doctor confirmed after the scans that the baby was perfectly healthy. She came later on Sunday to testify of the healing. We were blessed with a new MacBook Pro!!! Ester & Meesh got to get away on a trip to NYC. May is a perfect month for us to slow down a bit, reflect on the first quarter of our year and get ready for a very busy June – August summer season for BE MOVED. So we decided to slow down the ministry travels and spend more time praying, fasting and being with family as we feel God is in the process of stretching us and getting us ready for MORE. We got to go on a family 4-day cruise, thanks to my awesome in-laws. Aria loved it and became friends with everyone on the boat. I loved the all-inclusive food option, being the foodie I am, I got to try some fun food like alligator, snails and frog legs (loved it all)! Siting and writing this update from the beautiful Country of Georgia. Located in the center of Eurasia. And thinking back as I get ready to minister here, I am so happy about all that happened in April. From domestic youth conference to international youth conference, a family cruise and an online webinar leadership training sandwiched in between. I would say it was a great month for BE MOVED! This is Brandon, during a casual conversation at our youth gathering he got interested about the Holy Spirit. I briefly explained, we prayed, he was baptized & began to speak in tongues for the first time. 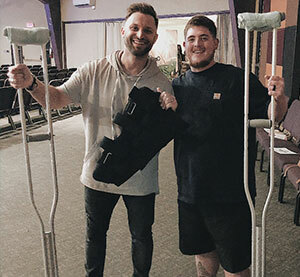 THE NEXT DAY… we prayed for his pulled ligament in his knee and we was healed! This is Alex, he was battling with stage three lymphoma cancer for a while. Doctors gave him a few weeks to live. We prayed and God completely healed him. The doctors have confirmed his full healing and cannot understand it at all!, he even said its as if he has brand new organs! 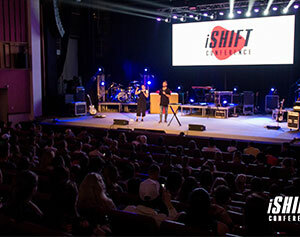 Speaking at iSHIFT Conference, an annual youth conference in Kiev, Ukraine that attracts several hundred youth and thousands watch live-stream from many different nations. 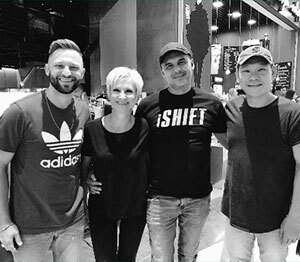 It was such an honor to spend time with the Lead Pastors (in the middle) of Skeemans Church in Kyiv, Ukraine & hosts of ISHIFT Conference and Pastor How Tan (On the right), Lead Pastor of Heart of God Church in Singapore. We got to spend quality family time on our 4-day family Cruise. We are spending extra time in prayer & fasting for BE MOVED in May because we feel God is taking us deeper and wider. We need to buy a new Macbook Pro for BE MOVED. Both of ours from 2009 are failing. We are looking for a media intern. Thank you all who prayed and supported us in March. It was unbelievable what we got to be apart of in Central Asia. For personal safety and their safety I am limited in what I am able to share publicly, but would love to have a personal conversation to anyone interested. Read below for a few highlights. April has some exciting trips and opportunities so please continue to pray for us. Thank you for being a part of what God is doing around the world through BEMOVED! We cannot do this without your help. While in Kazakhstan, I got to go snowboarding, one of my favorite hobbies. 9 of my 10 days on this trip were filled with ministry, so we had to make good use of our day off. I spent 10 days in 2 countries. 9 of those days ministering in 2 conferences, 2 churches, 2 teen centers, and also spoke at a new church grand opening service. It was a packed schedule but so fruitful. 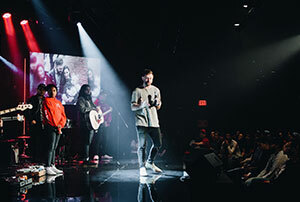 We saw so many salvations and healings it was too hard to count. This trip was made possible only because of sponsors like you who specifically covered my flight and expenses while there. I got to witness so many people give their life to Jesus! There were more than 30 in this one service alone. 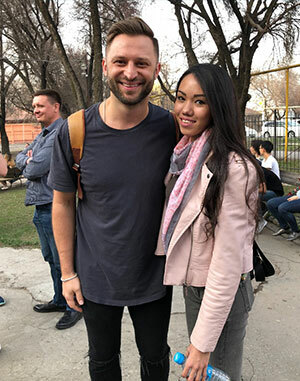 It was so special that one pastors even told me that he had never seen this many people give their lives to Jesus at one time in Central Asia! On this trip I got to encourage many church leaders and people who are sacrificially giving their lives to serve these countries. I am still receiving messages almost daily with testimonies of transformed lives, changed mind sets, doctor confirmed healed bodies and people who are living in freedom! Even after 3 weeks people are still sharing testimonies and talking about what God started in Central Asia on this trip. I got a message this week that one girl who had severe hepatitis from medication and yellow in her eyes was doctor confirmed completely healed. Another message where young people are so fired up that they are going around and telling people about Jesus and praying for the sick! This is Eva, she had a fractured ankle, could not walk or put pressure on her foot and was in a cast. I prayed for healing for her at the youth conference. A few days later she went to the doctor to get an x-ray and he was shocked because there was no trace of injury at all! I met Camilla last year when I was speaking at a youth conference in Kazakhstan. She had extreme scoliosis with her spine in a letter S shape. After we prayed she said that within the next several days her back would start improving drastically every day until it was fully healed! She came to testify and said her doctors could not explain or understand it. Andrew came to the conference with a ripped ligament and break in his right knee from skiing. He had an x-ray done and the doctor told him he had to have surgery. 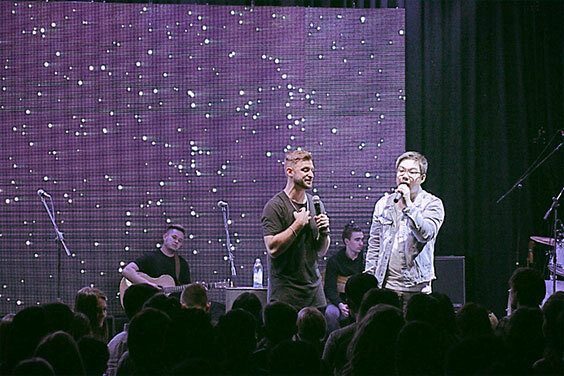 That same evening came to the conference… after we prayed he was instantly and fully healed. With amazement he took off his brace and began jumping with absolutely no pain and all the swelling was gone. On the left is Alisher. 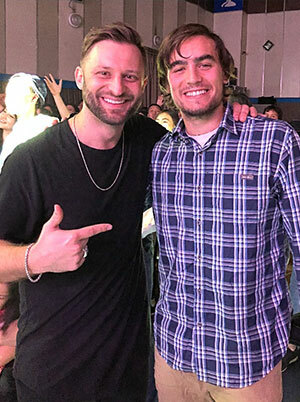 I got to lead him to Christ last year and also prayed for his injured knee which was healed. Since then he has been sold out to Jesus. 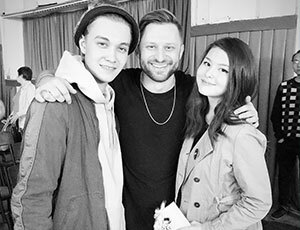 On the right is his friend who had never been to a Christian church before but came and I got to lead her to Christ because he invited her! Successful & safe travels to central Asia, and no problems with the governments, passports or visas! Although there were some close calls. 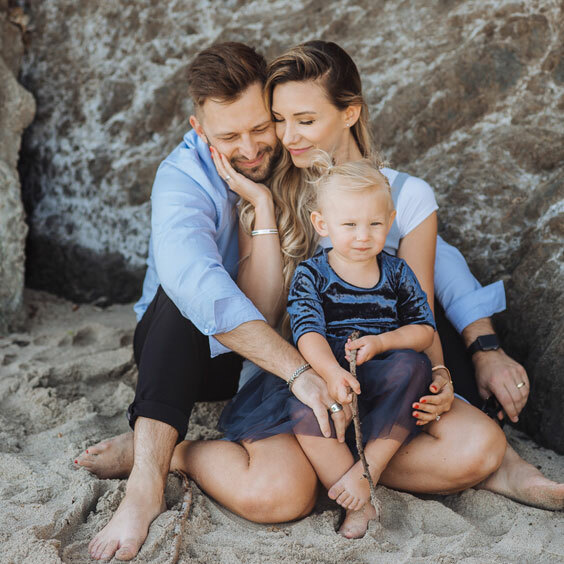 Our family is Healthy and happy. Just a few weeks ago we heard about the passing of Billy Graham into eternity. As he said it so well “My home is in heaven, I’m just traveling through this world.” He was a true general of the faith. Because of him heaven got a whole lot more populated. I am so glad that we can look up to someone who was used by God. But I also believe that God is not only raising up powerful individuals as He did with Billy Graham. I believe that God is raising up A GENERATION to walk in their rightful Identity and release God’s authority in this world! This is the passion of BE MOVED, to Reach, Raise & Release a generation. Can you imagine a generation that knows who they are in Christ, operates in that authority and walks in their divine purpose? This is the revival that I am believing for. Thank you for being a part of what God is doing around the world through BEMOVED! Aria’s first time swimming in the ocean! After 3 days of ministry in Miami area, we got to take a day and go to the beach! Aria didn’t want to get out of the water. Ester and I started off the month in the Dominican Republic. We were there for a week partnering with an organization called Compassion International. Compassion supports 1.9 million children in 25 countries who live in extreme poverty. We participated in the unbelievable work compassion is doing, from serving, feeding, having church services, visiting families to praying and sharing Jesus. You can also join us in this truly life changing adventure by starting a relationship with a child. For only $38 per month we get to provide our sponsored girl with food, water, health care, education and most importantly mentorship from a local church. We write letters to each other, send prayers, encouragement and love. Meeting our sponsored girl Brianna! We get to speak life and give love to a girl that may not have been able to get it another way. I had the privilege to teach at YWAM (Youth With A Mission) located here in southern California. It is a 6 month discipleship training program. I taught 3 hours daily for a week on Identity and faith. And the last ministry trip for February was to Miami. 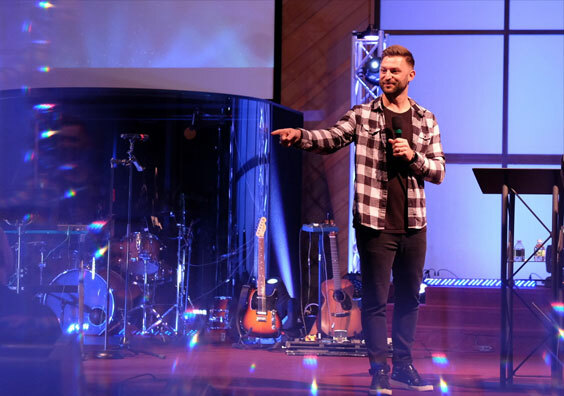 I spoke at a youth conference of 600 youth and young adults. The event was a Friday and Saturday. Then Sunday I preached two services at a new church plant in north Miami. Over all this was a powerful month of ministry and relationship building. This is Tasha, one of the YWAM students I got to teach last month. Was dealing with chronic pain through her body for years. We prayed & Jesus healed! ALSO THIS IS CRAZY: from an accident she punctured a hole in her stomach… not only was she healed but God made the scar completely disappear! Got a chance to remember and honor Billy Graham. 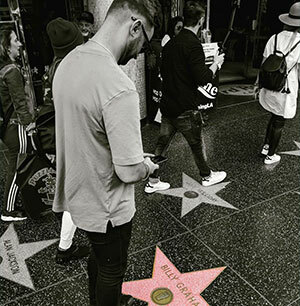 Of all the “stars” we have today, this is one that is actually worth following. I am compelled to dream and live bigger because of him. We got to meet Brianna, a new part of our family whom we sponsor from Dominican Republic. We love the holiday season because it’s full of family, friends and food…and I love to eat! We Pray that this season brings you supernatural Joy and true deep love in relationships. And thank you for being a part of what God is doing around the world through BE MOVED! November was busy and fun! Ester and I got to celebrate our two year anniversary in Germany. We had 3 free days between ministry to explore the beautiful city of Breman & Berlin. We loved visiting different historical areas and spending time together. This was Ester’s First time away from Aria (she even teared up our first night away from missing her). But Aria is the best baby and loved her time with grandma. She also learned how to walk as a 9 month old, and now at 10 months old she has 12 teeth! Growing up so quick. 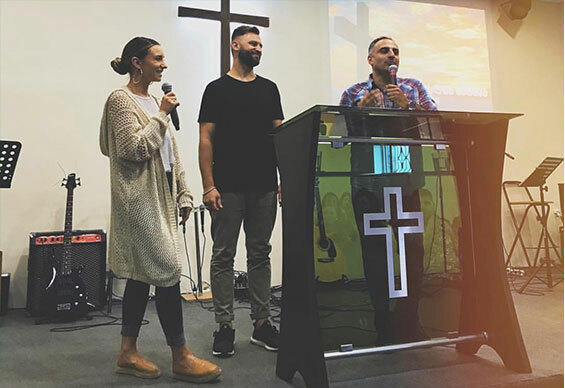 It was incredible to be a part of what God was doing in Germany and Vancouver, Washington in November. Got to minister in 4 cities in Germany before coming back to minister in the US. We got to spend time with Ester’s side of the family on Thanksgiving. It was so fun to see relatives from all over the US. It was a great Honor to speak a couple sessions at the conference in Breman, Germany. With 1,500 people this is the largest conference in northern German. I spoke alongside some very big name from around the world. Ministering in Germany is very different from most parts of the world because people are very intellectual and process mostly with their minds. Also being a spiritually dry country it was a fun challenge that I absolutely loved. God came in such a supernatutal way that most of the Germans were amazed. Many people gave their life to Jesus and then pray for the sick and many received healing. From Broken bones, shoulder and leg injures people were healed! I have been receiving many testimonies of awesome healing from the conference. We also went to Berlin, Hamburg and Stuttgart. Every city that we ministered people were saved and healed! At a worship night in Stuttgart area, we saw 600 youth show up and pack out a 300 person room. It was so full that there was standing room only. In that service I got to lead Franz to Jesus who was a Krishna follower. Franz came to the Sunday morning service the next day, was sitting in the from row and worshipping with his hands lifted. I have fallen in love with Germany and know that God will continue to use me there. I feel God has given me a special grace to be able to see this spiritually cold country come to Jesus. Many of the pastors there were confirming that I carry something very unique for this country and the people are responding very well. This girl fell off a horse at 12 years old. This accident hurt her spine and caused pain in her back daily for the last 10 years. 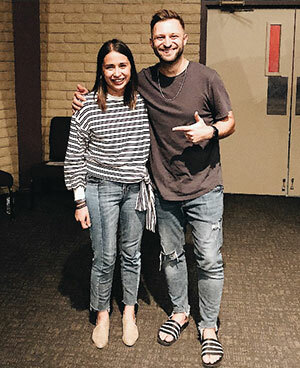 After we prayed she was healed and wanted to share the story with me, so she found out where I was preaching next and came to that next city to testify! This is Franz, he’s believed in Krishna. I got to pray with him inviting Jesus into his life! He came back Sunday morning and was in the front row with his hands raised worshipping Jesus! He was moved with joy & love. The beginning of something amazing for him. We are seeing more people becoming partners of BE MOVED. Every donation dollar & prayer is helping us reach the world! Keep people involved by following up with a personal message or discount code. Start by replacing the full-width header with a different color or a high-res image. If you sell things, welcome new customers after a purchase, let lapsed customers know you miss them, or offer a deal to your best customers. If you’ve connected your store, try adding product or product recommendation blocks, too. If you don’t sell things, welcome new subscribers to your list, thank people for attending an event, and let inactive subscribers know you miss them.